I’m happy to announce that the new Ex-Libris is now live at www.english-exlibris.com. All new updates and content will be posted on the new site including the Winter Quarter Class Offerings. All of the classes are already up so feel free to explore and get excited. I am waiting on a few more descriptions, but they will be up by Friday or Monday at the latest. If you have any suggestions on how to improve the site please don’t hesitate to let me know. Ex-Libris is meant to be your news source and provide access to information you need. Any feature that will improve your experience will be considered. Have an excellent day, and I hope you enjoy the new Ex-Libris. 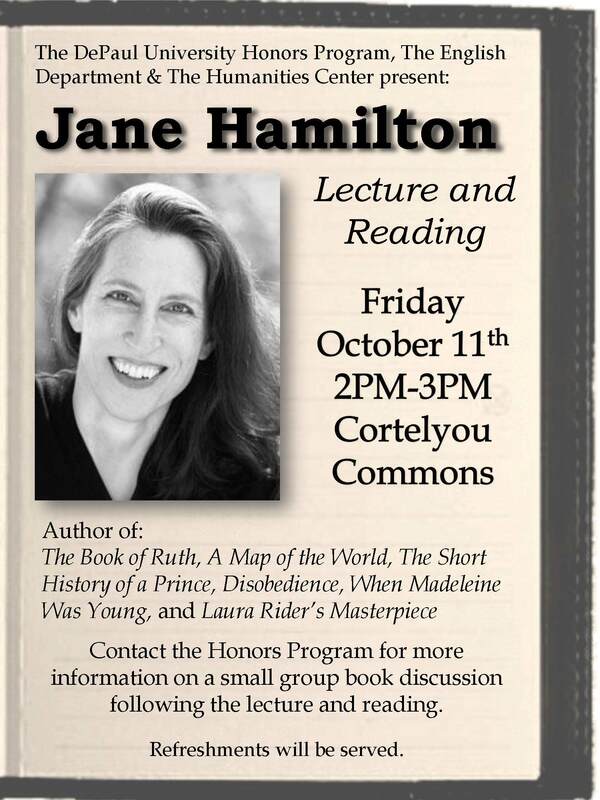 Jane Hamilton, author of The Book of Ruth, A Map of the World, The Short History of a Prince, and other favorites will be coming to DePaul on Friday, October 11th from 2 pm to 3pm. Hamilton will read from one of her books, and lecture as well. All students are encouraged to attend. The Honors Program can help you join or set up a small group discussion following the lecture and reading. The event is co-sponsored by the University Honors Program, the English department, and the DePaul Humanities Center. Jane will be reading from new work, and her lecture will focus around this year’s Honors Program theme: “Searching for Home”. Jane is an engaging speaker, and this promises to be an enriching event. I hope you’ll be able to attend, and that you’ll share the attached flyer with your students. “And gladly would he learn and gladly teach.” Said Chaucer of his clerk in the The Canterbury Tales. MAWP and MAE students interested in lending their knowledge and expertise to two-year colleges should heed that line. Students interested in pursuing a teaching career in academia should consider this as an opportunity to get some real world experience. Interns work alongside an experienced two-year college professor who guides them through a 16 week semester. The internship is for the Winter Quarter. Interns must register with Professor Green for ENG 509 in order to pursue the internship. More information on the process is available on the department’s website. All interested graduates should contact Dr. Goffman by email before sending in application materials. 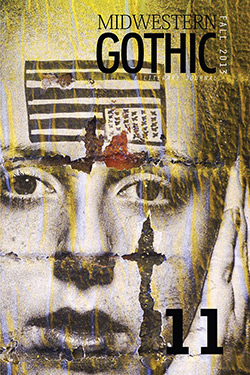 Masters in Writing and Publishing alumni Michael Van Kerckhove and David Mathews are celebrating their respective publications in the fall 2013 issue of the Midwestern Gothic literary journal. Michael and David are authorial pioneers in the journal’s first foray into creative nonfiction. Copies of the journal are available in various e-book formats for $2.99. If you have your heart set on a print copy you can pick one up from Amazon for $12.99. Those who are unable to purchase a copy should consider sharing the journal’s page on Facebook, Twitter, and Google+ to help Michael and David get recognition for their outstanding work. Don’t miss Michael’s personal essay, “Dance of the Ring” and David’s poem, “Sketches of Northwest Side of Chicago Parish Carnival”. Pick up a copy of the Midwestern Gothic Journal today. The EGSA is going to Uptown Poetry Slam at The Green Mill! One of Chicago’s most famous jazz clubs, The Green Mill sponsors a Poetry Slam night every Sunday from 7pm-11pm. As lovers of all things literary, we are planning an official EGSA event to go on Sunday, October 13th at 7pm. Cover is $7. We hope to see you there! Pour it into a tumbler with an ice cube and nurse it until your lips are numb with the season. Then, when you’re fully immersed in the warm oranges grab your pen and send in an application to become an editor for Threshold. The deadline is fast approaching for this thrilling opportunity to be part of an award winning literary magazine. The pride and joy of the English Department, Threshold provides students hands on knowledge through collecting submissions, editing, and then publishing a literary magazine. Your ticket to be part of the experience is a 250 to 500 word application letter describing your relative experience and commitment to the magazine. Be a visionary and take Threshold to place it has never been before. Professor Borich looks to elevate the magazine to new heights and is excited to begin work with a motivated group of students. 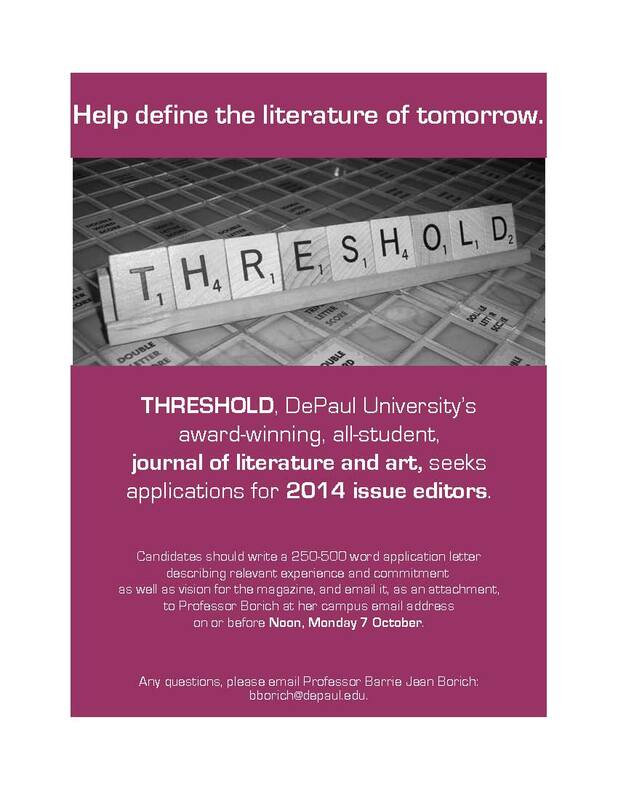 All who are interested should send an email to Professor Borich at bborich@depaul.edu before noon on Monday, October 7th. Let your imagination run wild. Crack your knuckles.Rotate your wrists inward, outward, and then fire off a few submissions to these journals looking to publish your exciting work. Submission deadlines are fast approaching so let those fingers rain down on the keyboard. SLAB is seeking submissions for their CURRY Prize in Poetry. In the past, SLAB has published Pushcart Prize participant Zan Bockes, poet Joseph Bruchac, and Young Adult author Arleen Ruth Cohen. 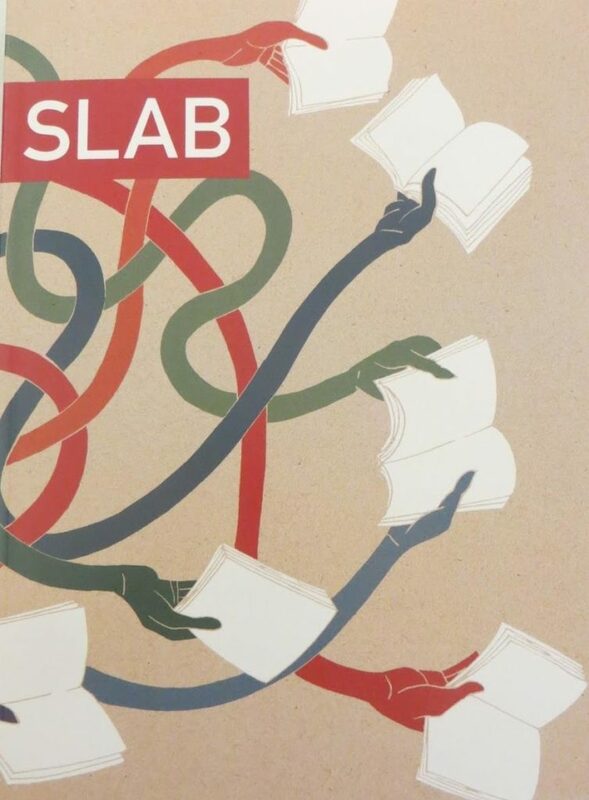 In fact, 2012 saw SLAB recognized as a recipient of the AWP National Director’s Prize for Content. First place: $600 and a limited edition hard-bound chapbook of the winner’s poetry. The Chicago Humanities Festival is hosting Professor Maria Tatar, the John L Loeb Professor of Folklore & Mythology and Germanic Languages and Literatures at Harvard University. 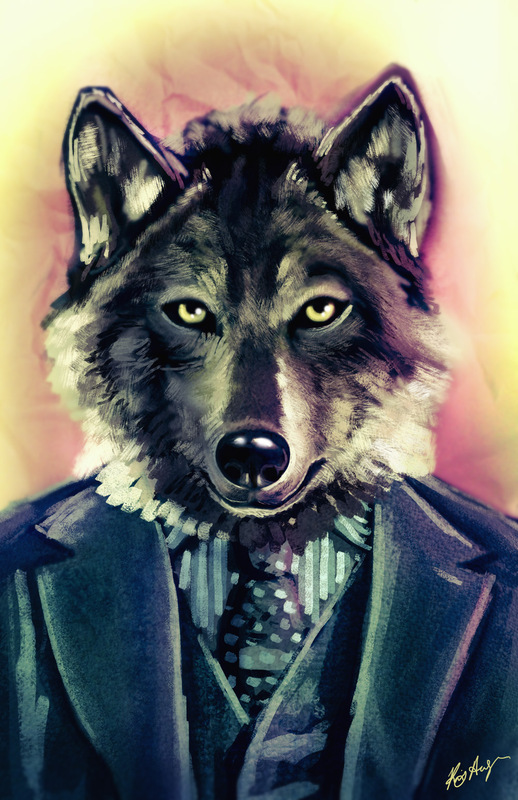 Professor Tartar will be giving a public lecture entitled, “The Big Bad Wolf Reconsidered”. The lecture begins at 12:30 on Sunday, November 3, 2013 at the Chicago History Museum in the Rubloff Auditorium, 1601 North Clark Street, Chicago IL 60614. Graduate students are encouraged to join the special graduate seminar from 1:00 to 3:00 p.m. with Professor Tartar. The seminar’s moderator will be CHF Artistic Director and Professor of Anthropology, History, and German at University of Illinois Matt Bunzl. Interested students should submit a brief biography (150- 200 words), including area of research, and a question/topic they would like to discuss with Professor Tatar during the seminar to Gina Di Salvo at gina@chicagohumanities.org by October 4th. Selected applicants will be notified by October 11th. The Illinois State Legislature is looking to hire graduate interns for a variety of positions. Interns work as legislative staff with either the partisan staffs of the Illinois General Assembly or the Legislative Research Unit and earn 8 graduate political science credits in addition to a $2,026 stipend. Applicants with a minimum 3.0 GPA are preferred for partisan internships and required by the Legislative Research Unit (LRU). The deadline for receipt of application is March 1, 2014. Internships start August 16, 2014 and end June 30, 2015. Apply and help the people in Springfield govern this great state of ours. We’ll all be counting on you to be the voice of reason in that house of madness. Andrea Moro, Professor of Linguistics at the Institute for Advanced Study IUSS Pavia and Director of the Research Center for Neurocognition and Theoretical Syntax comes to Chicago to present his lecture, “The Boundaries of Babel. Reflections on Brain and Grammars”. For more details on this thrilling lecture or to RSVP, kindly click here. The lecture will be held on Monday, October 14th at 6:00 PM at the Italian Cultural Institute, 500 N Michigan Avenue, Suite 1450. Denise Chavez, a critically-acclaimed playwright, is reading from her latest novel The King and Queen of Comezón. The reading will begin at 6:00 pm and go until 8:30 pm. It will take place in the Student Center Building on Sheffield in Room No. 314. 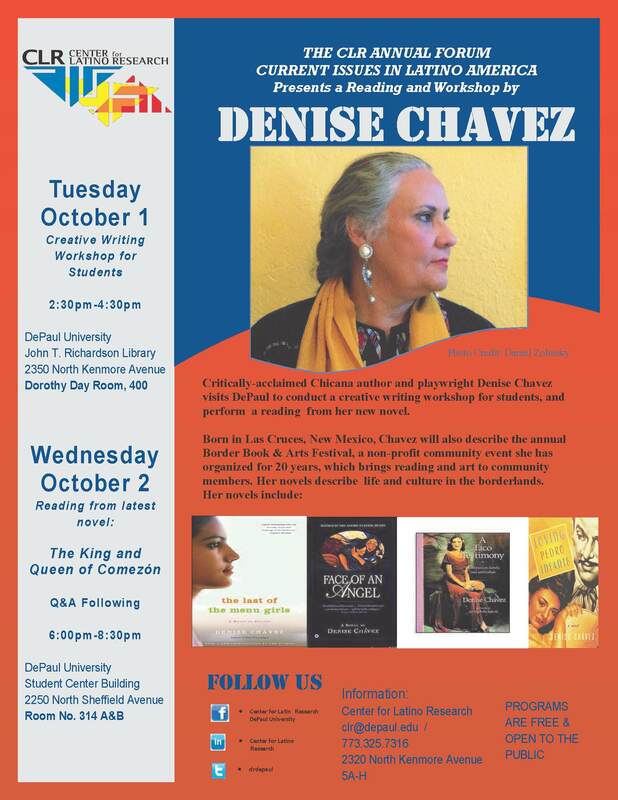 Don’t miss this wonderful chance to meet with Chavez and discuss the annual Border Books and Arts Festival, a community event she has organized for 20 years. Do the grey clouds hanging overhead portend a storm? Will the onset of October herald a cool, cold rain? Hardly. October’s grey doldrums are kindled by the cardinal reds, yellows, and oranges of graduate opportunities tumbling from the trees. Writers and students interested in aiding those in our community should pursue the Working in The Schools (WITS) mentoring opportunity. English faculty, staff, and students mentor fourth through sixth grade students from a Chicago Public School that is at least 90% low-income. Mentors do not have to leave campus to help students. WITS will bus the students to Arts & Letters Hall each Thursday, beginning October 10th, from 3:30-4:30, in Arts & Letters #412. Two mentors usually work with a single student. During the mentoring hour you will take turns reading to one another and then spend the remaining time working on the student’s homework. Training Session: Thursday, October 3rd, 3:30-4:30, Arts & Letters Hall #412, Tovah Burstein from WITS will lead a training for all potential English Dept. volunteers. She will help us understand the mentoring process. This training will also be an opportunity for you to be paired with another volunteer. 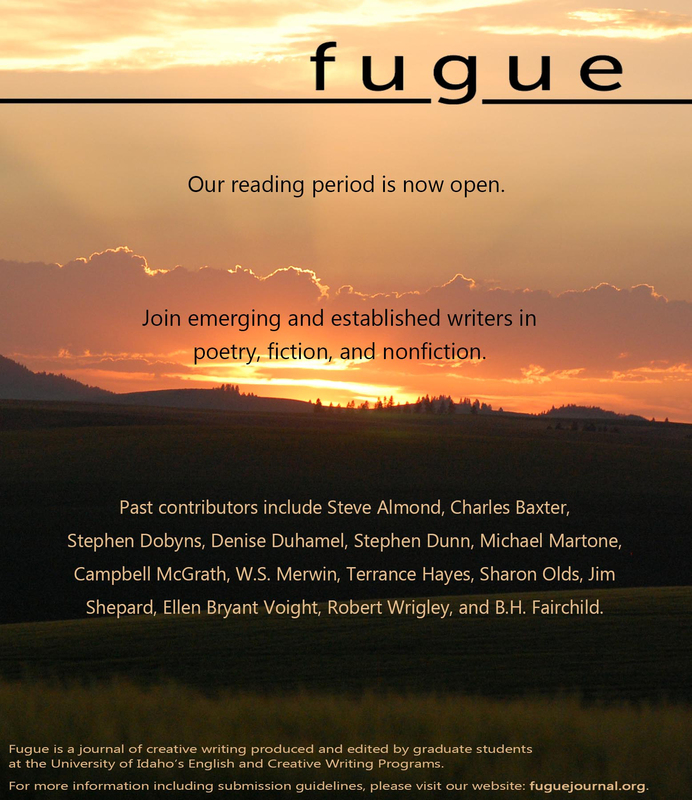 Fugue Literary Journal, a magazine run by English and Creative Writing graduate students at the University of Idaho, Moscow has opened for fiction, nonfiction, and poetry submissions. The Journal just celebrated its 25th anniversary last year, and looks forward to publishing quality writing from new and established writers. Submissions are accepted online only. Poetry, Fiction and Nonfiction submissions are accepted September 1 through April 1. All material received outside of this period will neither be read nor considered for publication. General submissions must be submitted along with a required submission fee of $2.00 per submission. Multiple submissions will be considered with a separate submission fee for each. All contributors to Fugue receive payment, via check, for their work and two complimentary copies of the journal in which their work appears. Fugue requests that contributors send no more than six poems, two short-shorts, one story, or one essay per submission. Submissions in more than one genre should be submitted separately and require separate submission fees. Fugue will consider simultaneous submissions (submissions sent concurrently to another journal or journals) as long as you notify them immediately if a piece you submitted simultaneously has been accepted elsewhere. To submit either a General or Contest submission, please click here.